Musical Collaboration amongst others with: George Garzone, Jim Black, Gerry Hemingway, Andy Middleton, Wolfgang Reisinger; Erwin Schrott, Jose Feliciano. Austrian, Vienna-based double bassist Gina Schwarz found a true, like- minded musical partner that helped her realize her irreverent vision for today's jazz. American drummerJim Black joined Schwarz's quintet for her fifth album, solidifying her reputation as a live-cell therapy to jazz, an opinionated musician who likes to play with opposites—wise and free, gentle and wild, contemplative and energetic, organic and eccentric, blending acoustic instruments with electronics. When you think more about it, these descriptions characterize Black's great groups since the beginning of the nineties. His bands refused to play by the rules or to be relegated to any stylistic definition. Such were his trio with saxophonist Ellery Eskelin and accordionistAndrea Parkins, The Tiny Bell Trio led by trumpeter Dave Douglas or his own groups with reeds player Chris Speed as Pachora, Alasnoaxis and Human Feel. Schwarz quintet, with keyboardist Benjamin Shatz, guitarist Heimo Trixner and reedist Fabian Rucker, add an updated, refined Viennese touch to the distinct, uninhibited drumming of Black. The clever, fast shifting rhythm section of Schwarz and Black is now embraced by open and intense interplay that simply calls to mess with with the pulse— stretching it, mimicing it, beating it at its own game. Together the quintet charge Schwarz's original compositions with passionate urgency, still, enveloped in an emphatic interplay. Schwarz's brilliant arrangement of Edgar Allen Poe poem The Bells as the title piece, features vocalist Marco Blascetta and reflects faithfully Woodclock's sonic vision. It is an intriguing, provocative piece, building its tension skillfully, following the suggestive poetic lines: Keeping time, time, time, / In a sort of Runic Rhyme, / To the tintinnabulation that so musically wells / From the bells, bells, bells, bells, bells, / Bells, bells, bells—. The heartfelt tribute to the late Charlie Haden, From Shenandoah highlights Schwarz beautiful, folksy bass solo, gifted with an immediate, emotional impact. The short free-improvised duets of Schwarz and Black, Rats & Bats and Broadcasters at work, cement the dynamic, rhythmic language that both have developed together, spiced with sharp sense of humor. Track Listing: Dr. Jekyll & Mrs. Hyde; Loophouse; Woodclock; Morpheus; From Shenandoah; Rats & Bats; Ping Pong; Broadcasters At Work. Personnel: Fabian Rucker: saxophone, bass clarinet; Benjamin Schatz: piano, keyboards; Heimo Trixner: guitar; Gina Schwarz: double bass; Jim Black: drums; Marco Blascetta: vocals (3). 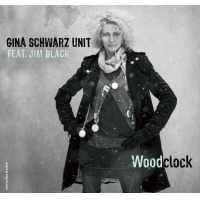 Gina Schwarz Unit: Woodclock By Raul da Gama - Jul 3, 2016 Ever since the brazen adventures of Airbass released in 2009 by the extraordinary bassist Gina Schwarz, she has strengthened her reputation as a musician and bassist of great repute. Since that release, for instance, Schwarz has set no limits to her explorations. Along the way, in a deftly balanced presentation of strikingly contrasting essays throughJazzista and now Woodclock Gina Schwarz offers beautifully turned, reflective and buoyant readings of sui generis works. Woodclock, with its exquisite with its cracked, angular rhythms is simply a pearl. Through it all Schwarz creates a portal into her world – no different from some of the finest bassist of all time, bassists who refused to be content with merely anchoring the rhythmic section of her bands. Gina Schwarz is a bassist with a deep knowledge of the bass. She is blessed with a natural ability for intertwining lines of colour and texture in a highly original manner. Her instrumental wizardry extends to an inventive use of supra-polyphonic interpolations akin to a musician playing the infinitely more versatile violin, transposing much of that instruments versatility to the larger, infinitely more cumbersome double bass. Great instrument aside, this is largely down to the judicious alchemy of Schwarz’s perception of how musical architecture and colour can collide to mesmerising effect. The music of this disc is a case in point and it is not merely evident in the profound beauty of ‘Woodblock’ after which the entire album is named, because of the bold performance of each on the songs in this repertoire. Beauty that is no accident. That such understanding of a complex instrument and such maturity of musicianship is emblematic this early on in the career of Gina Schwarz is both surprising and welcome. It is no surprise, however, to hear how well integrated this work sounds. The bassist’s approach is well-formed and advanced, yet her style is fluid and deceptive, her growling, euphonious tone artfully leavening her logical but nonetheless oblique and unpredictable melodic thinking. The added support of four highly empathetic musicians – saxophonist and bass clarinettist Fabian Rucker, in particular gets right inside the music, and pianist Benjamin Schatz, drummer Jim Black and guitarist Heimo Trixner make yeoman contributions as they enunciate the music’s message’s complex meditations on the interaction between its visceral humanity and virtual reality. All in all this is a beautiful recording with made warmth and detail, and extraordinary musicianship. Track List: Dr. Jekyll & Mrs. Hyde; Loophouse; Woodclock; Morpheus; From Shenandoah; Rats & Bats; Ping Pong; Broadcasters At Work. All About Jazz musician pages are maintained by musicians, publicists and trusted members like you. Interested? Tell us why you would like to improve the Gina Schwarz musician page.